Can You Have Too Many Pin Cushions? I normally would answer ‘yes’ to that question as, to be honest, I simply haven’t got enough pins to fill that I have made and received. However, despite having a million and one pin cushions, the one next to my machine seems to vanish on a regular basis. 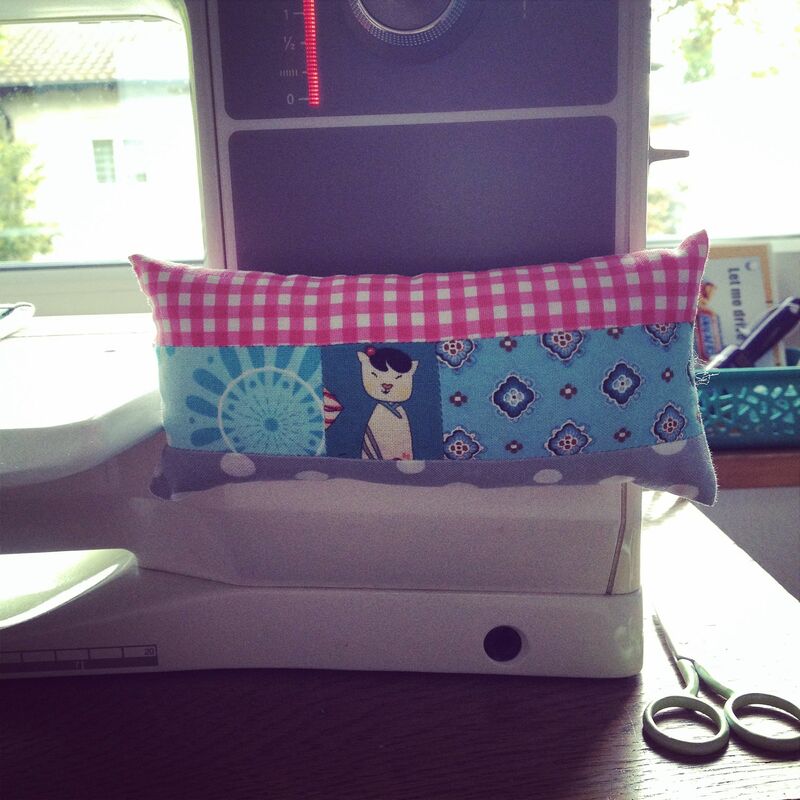 I had a brainwave this week and made another pin cushion after all. One that won’t disappear; one that is attached to my sewing machine. I literally whipped that up in about ten minutes, using a cheapo ribbon and popper to attach it to the machine. 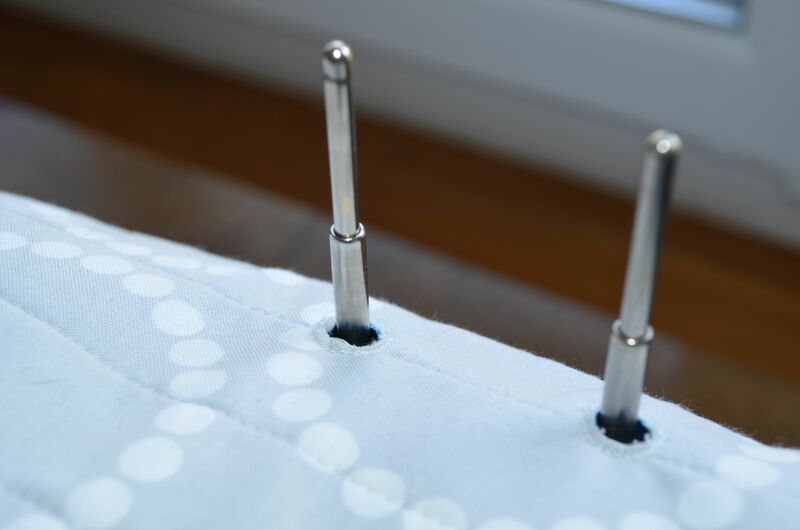 I’ve already used it to sew another one as I thought I would write a quick tutorial on how I made it (I’m sure you can imagine how I made it but sometimes it’s just nice to not have to think about measurements and construction). Imagine my embarrassment when I managed to cut the ties too short. What is it they say ‘measure twice, cut once’? More like ‘measure once, cut twice’ in this house. So the tutorial will have to wait till next week when Little Miss Bossy-Boots is in Kindergarten. For this pin cushion I’ve added a little scissors holder (a very fancy description for a piece of ribbon attached to the tie) as those seem to go walkabouts all of the time too. I bought a little espresso cup without saucer at the charity shop for 50 Rp (about 35p). Not because I drink espresso; no, just because I thought it was cute. Then I added some mirror ball dots and ended up with a sweet pin cushion which I gave to my sister. I bought another espresso cup with roses on. 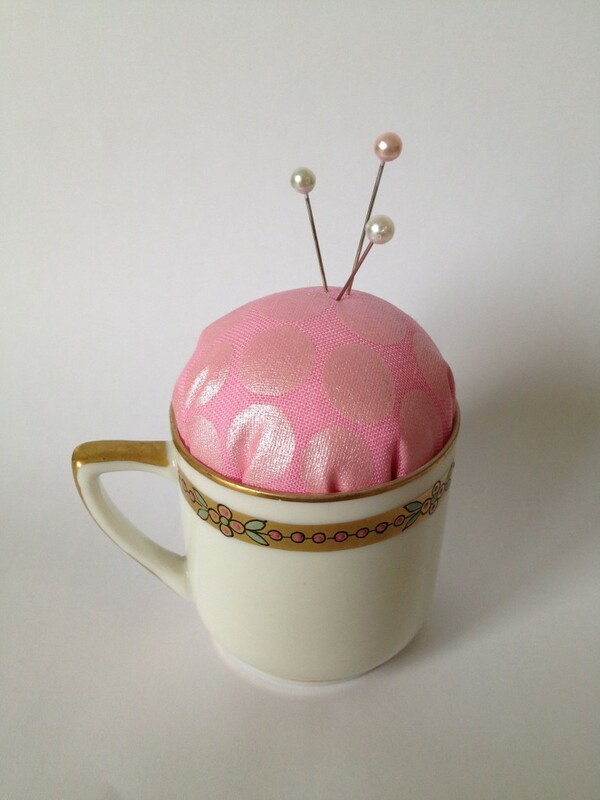 Hmmm, I might have to make another pin cushion…. Goodness, I can hardly remember when I last wrote a post for this blog. However, the cobwebs have well and truly been dusted off and I’m excited to share lots of new makes with you. First, is a cushion I’d promised Little Miss Bossy-Boots ages ago. 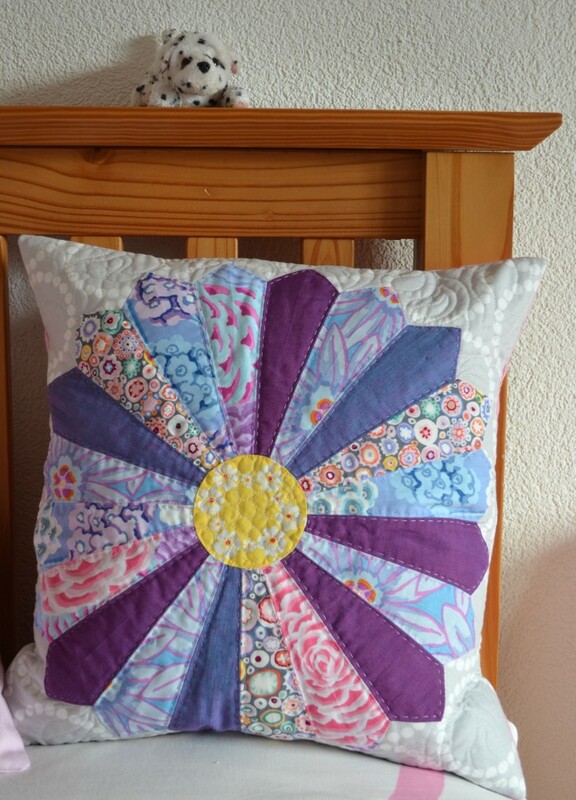 She’s gone off the pink and wanted more purple in her room so I bought some lovely Kaffe Fassett’s and made her a Dresden plate cushion. 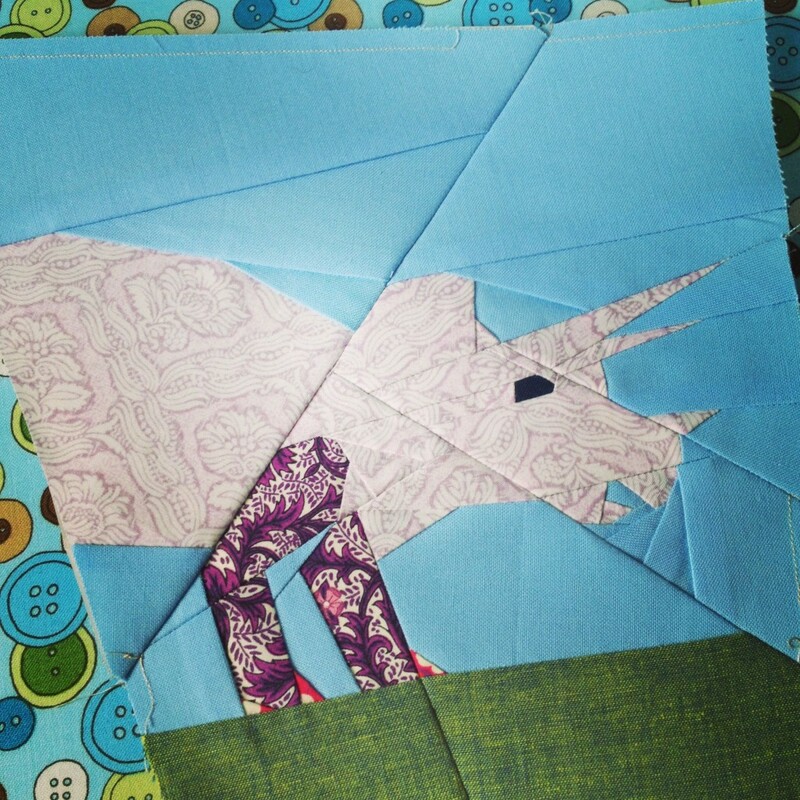 Everything was going really well until I decided to hand quilt it. 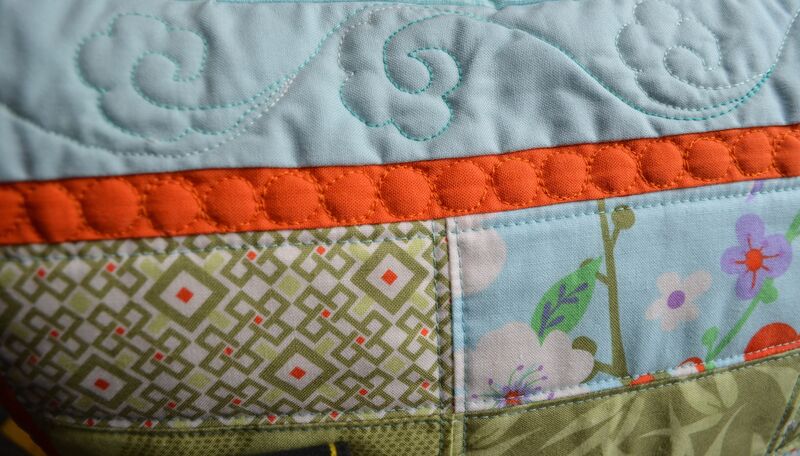 Hand quilting is hard on your hands so I put it away for a while before finally finishing it yesterday. I added some free motion quilted pebbles to the centre and some leaf shapes to the background. The cushion was pieced and quilted with Aurifil 50wt (2024); for the hand quilting I used some Perle cotton but the very fine one. Could it be a 12? I’m not sure. 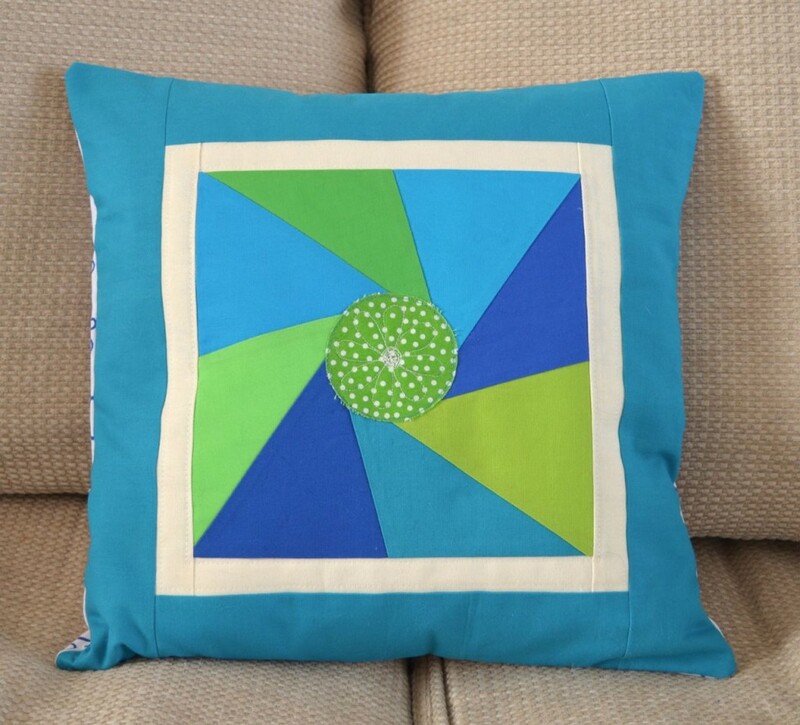 Next is a quilt to go with the cushion. I’ve already started cutting the fabrics and I’m adding lots of other colours to the mix. This is going to be a big quilt that will, hopefully, last the Little Miss a long time so I don’t want it to be too restricted colour wise. I love all of Kate Spain’s fabric lines and would buy every single one of them if I had more money. I did, however, buy a charm pack of ‘Good Fortune’ two years ago. Some of those charms were used in my first ever foundation paper pieced project, the double ring of flying geese, Lynne taught at the first Fat Quarterly Retreat and which ended as a cushion. Some more charms were used to make this cushion. I do apologise for the quality of the pictures. It’s a grey and miserable day here today. 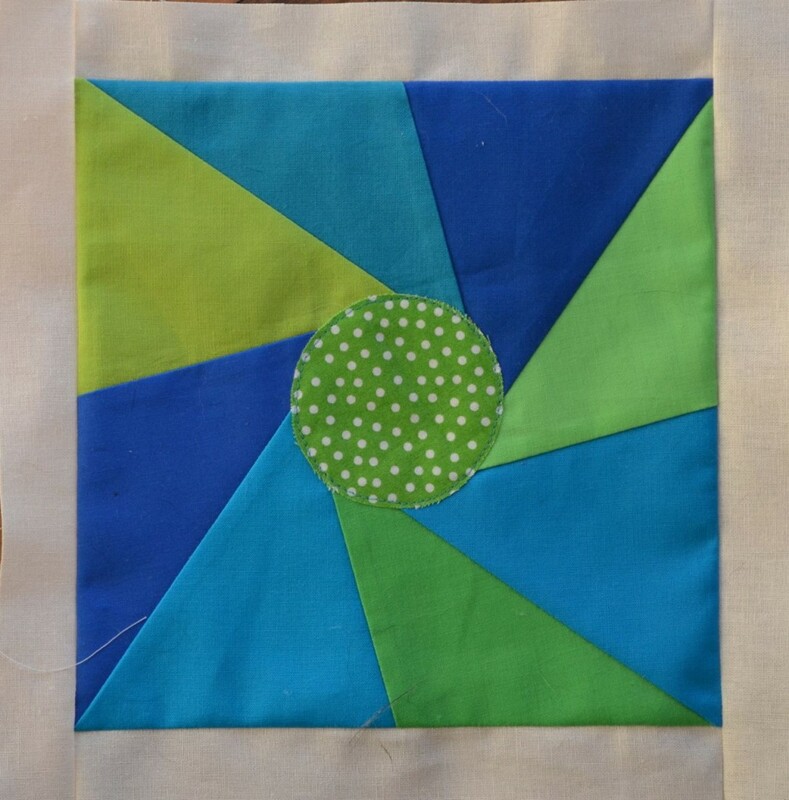 This time I decided to play around with the quilting as I really want to become more confident at free motion quilting. I decided to quilt a grid in the centre simply following the seams using an Aurifil 50wt (5006), do some pebbling on the orange border with some Aurifil 40wt (2150) and a leaf pattern in the blue border with my favourite variegated Aurifil 40wt (4654). My pebbles are definitely pebbles and not circles and some of my leaves have been visited by caterpillars but I love the textures and imperfections and can’t wait to do some more free motion quilting on my Heron Log Cabin which is up next. 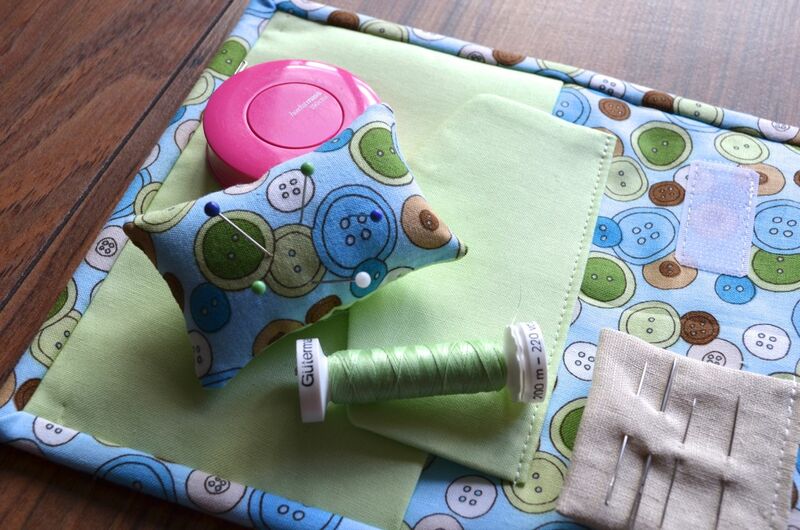 I have found that for me the ideal speed at which to free motion quilt is a snails pace. That’s alright, though, it becomes quite relaxing when you go that slowly. This is my first finish on this quarter’s Finish Along list. 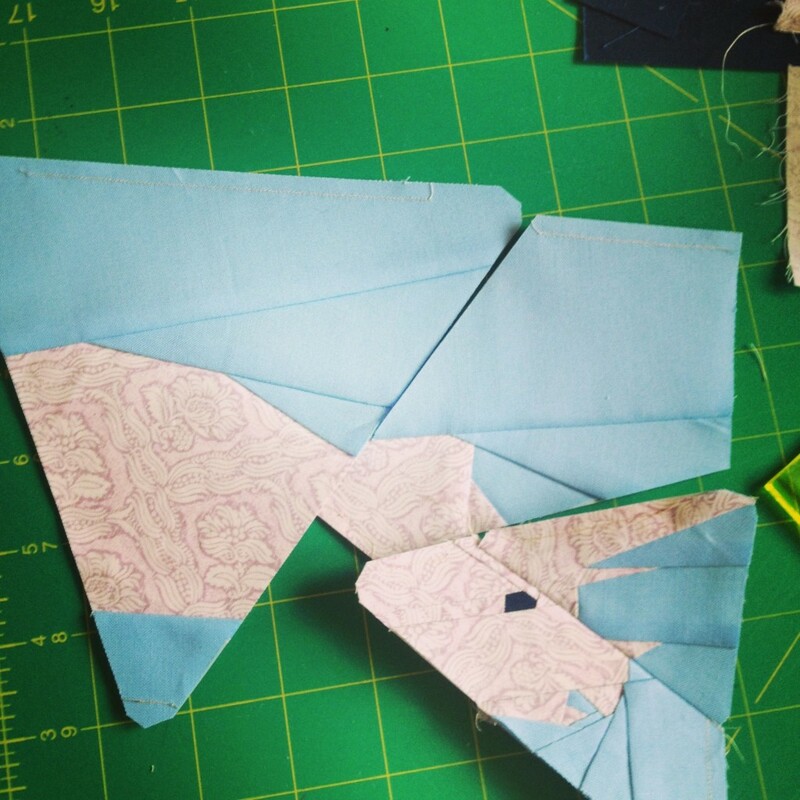 When Juliet from a Tartankiwi asked for testers for some of her new foundation paper piecing patterns I jumped at the chance. I love the robin I did before Christmas even though he’s still not been turned into something useful. 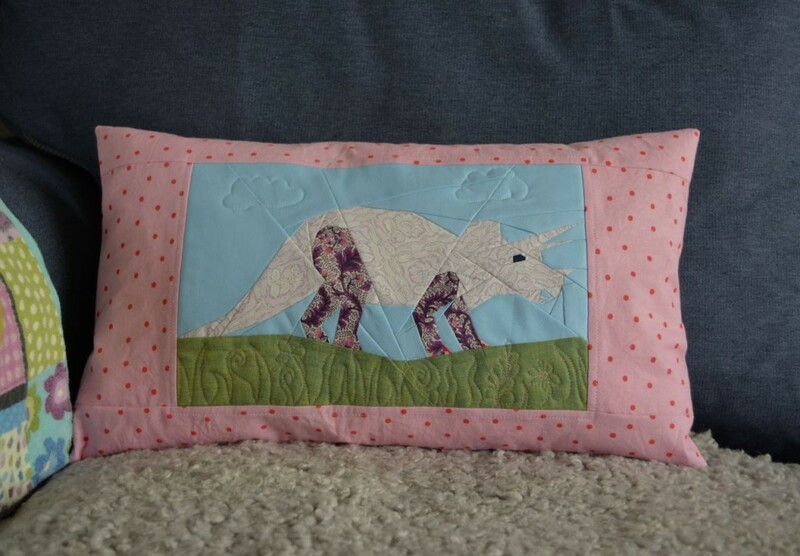 This time I got to try sewing a triceratops, one of my favourite dinosaurs. Being a mostly female household (Charlie the cat doesn’t really count, does he?) I pulled out some fabric in pinks and oranges but changed my mind at the last minute and went for purple Liberty Tana lawn instead. Purple is Little Miss Bossy-Boots favourite colour at the moment and I thought it would be fun with a purple triceratops. This pattern contains a gazillion minute little pieces and the lawn fabric really helped with reducing the bulk. Once I’d finished the head I admit that I did breathe a sigh of relief. I don’t know about you but I stop breathing when I concentrate really hard. The detail is fabulous, though, and I was happy to continue with the legs, giving my triceratops red toe nails (don’t look too closely, though, as I managed to forget one). Wondering about the cellulite? Wonder no more. I was a bit tired at the end and didn’t line up the bottom quite as well as I could have. As this one is for us I didn’t worry too much and left it the way it was. I’m sure she isn’t too bothered about her lumpy bottom. 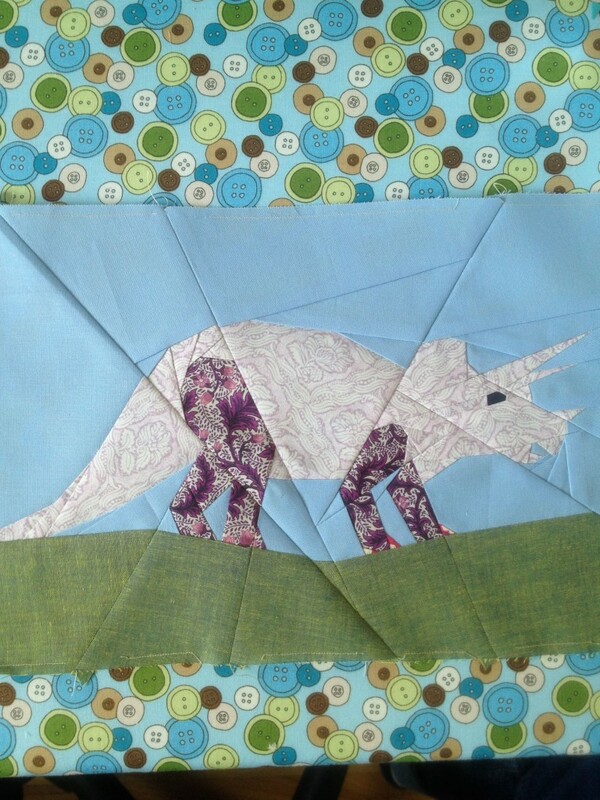 I didn’t want this lovely dinosaur to end up as a WIP (especially as it is on my FAL list) and started quilting it straightaway. The bulk of all the seams in the head made it too difficult to quilt so I just did two clouds in the sky and a few plants in the grass. Quilting and piecing was, as always, done with Aurifil 50wt. A bit of dotty fabric and, hey presto, we have another cushion for the sofa. This pattern hasn’t been released yet but I’ll let you now as soon as it’s in Juliet’s shop. Edited to add: Get the pattern here. My sister called Friday afternoon to ask if I wanted to go to the big Swedish blue and yellow shop. I jumped at the chance as I don’t drive and have to change trains and take two busses to get there. I had been wanting to go for a while now to buy a rug for Little Miss Bossy-Boots’ room. Little did I realise that we would come home not only with a rug but a chair too. 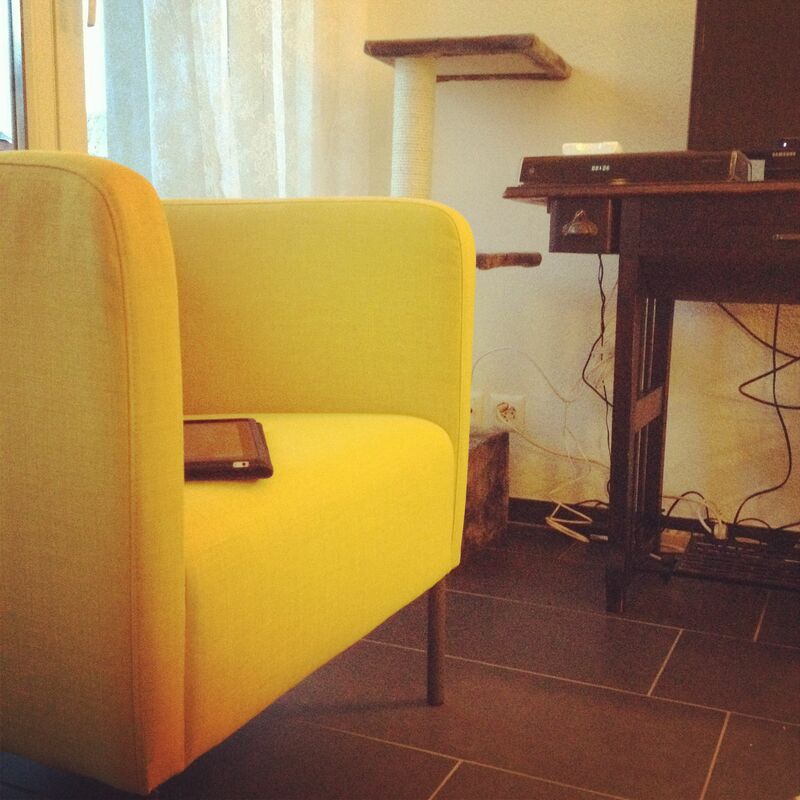 A bright yellow chair. I love the retro feel and I’m sure it will go well with the turquoise tv cabinet that’s arriving on Tuesday (and will, hopefully, hide all the electric leads). The best thing about it? 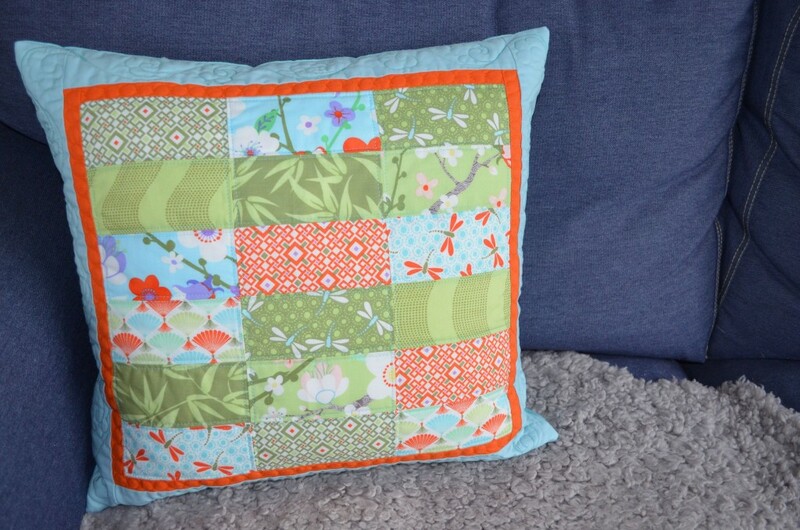 It really needs another cushion and I’ve got an excuse to start a new project! Sewing will have to wait a little bit, though, as I’ve slept awkwardly and have a very stiff shoulder. 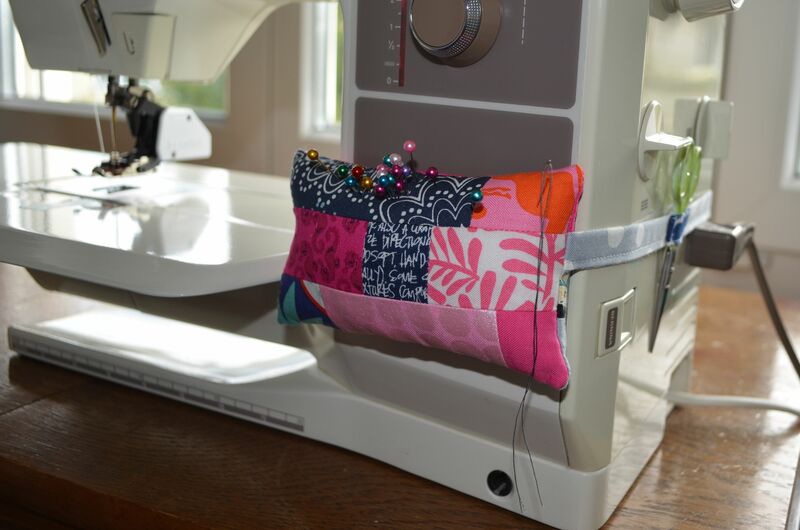 I’m alright doing some hand sewing (just finishing my DQS 14 mini) but the machine will have to wait. 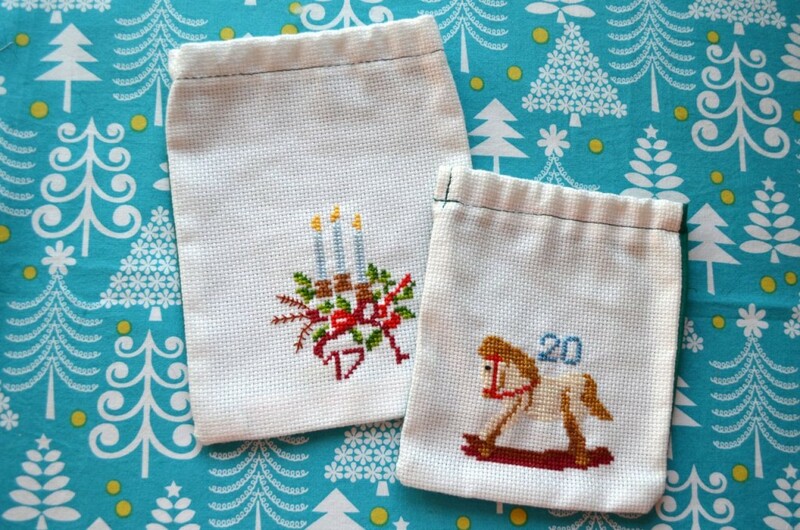 Many, many years ago, my sister, mother and I sat down and embroidered an advent calendar for my grandmother. While talking about Christmas and advent calendars she mentioned that she had never had an advent calendar. My grandmother’s birthday was on November 30th so we thought it would be fun to make her an advent calendar that year and it was a huge success. For years she would give us her advent calendar a week before her birthday and we would fill it for her. When she died the advent calendar disappeared into a cupboard and none of us really thought about it. That is, until my mother got it out and gave it to me for Little Miss Bossy-Boots. The calendar had definitely seen better days and most of the little bags were falling apart. Therefore I decided last year to take all the bags apart and sew new ones. I also used some woven vilene to stabilise the embroideries. Some of the bags we made were hardly big enough for more than a praline so I’ve tried to make these a little bigger. 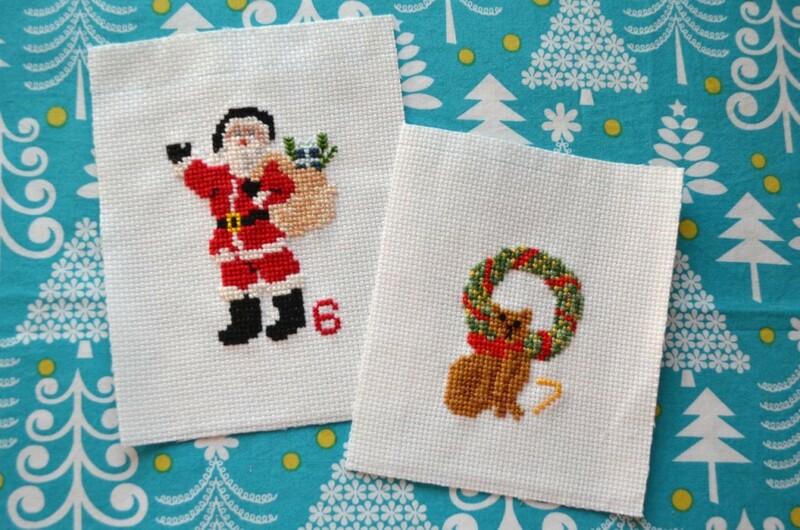 The easiest way was to sew a ‘frame’ around the embroidery and for this I bought a lovely red and white stripe that reminds me of candy canes. The back of the bags is a green cotton from my LQS. I’m so happy that this advent calendar is in use again. I haven’t quite finished all the bags so I’m sewing like mad to keep up with finishing and filling them. This calendar will hopefully be in use for another twenty-something years now that it’s all fixed again and all the work is definitely worth it, I think. My sister asked me quite a while ago whether I would make her a sewing kit similar to the one I had made Rebecca. The biggest change she wanted was a space for a crochet hook or two. Well, I changed quite a few things because Rebecca’s sewing kit was made specifically for a student who needs to be able to fix hems, sew on buttons etc. My sister’s was made with a crocheter in mind. I’m not sure if I got it right but at least it looks cute! I added a handle because I thought it would be easier to move from place to place, especially while holding a project. Furthermore, I turned the pockets around so that I didn’t need to put a flap over the crochet hooks to keep them from falling out. 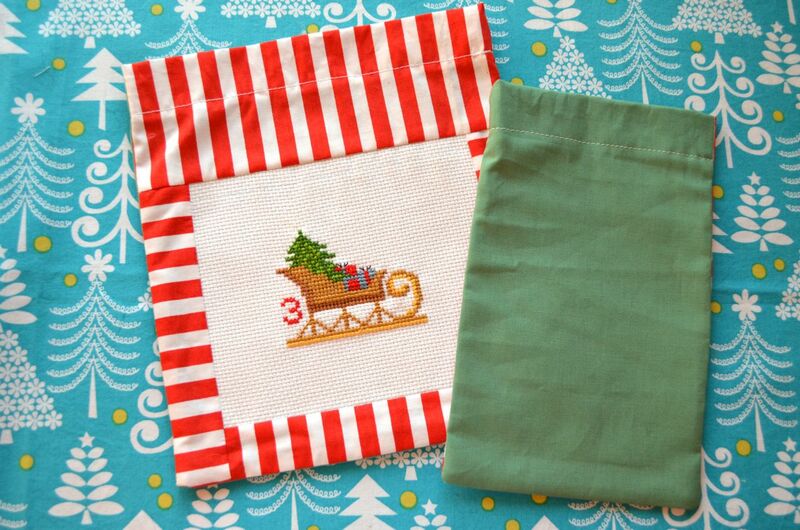 There’s a big pocket for a tape measure and some thread (or a chocolate bar? 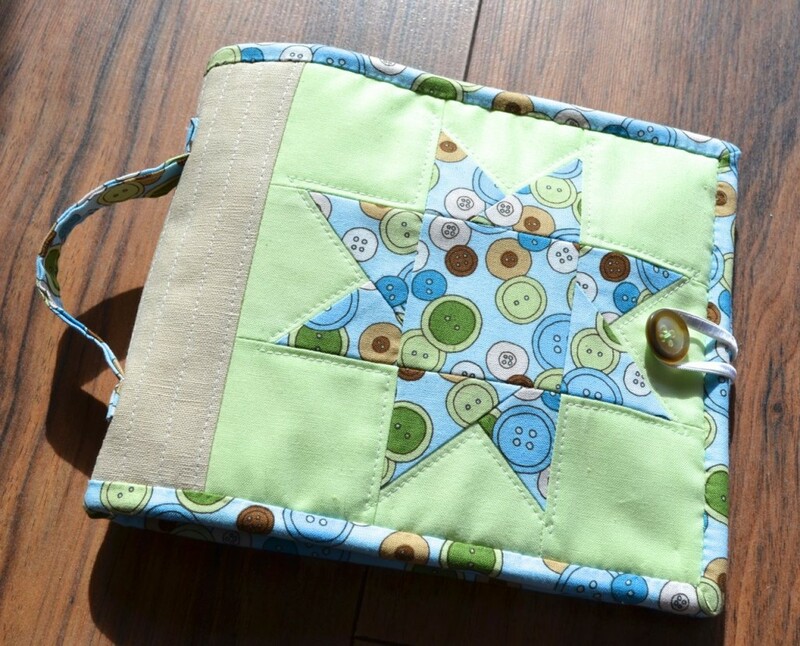 ), a linen square for needles and a small detachable pincushion on one side. On the other side there’s room for some scissors and four crochet hooks. The little pincushion is my favourite part, I think. Because the scissors kept sliding out I added a little tab that closes with a popper. There’s nothing worse than losing your scissors. 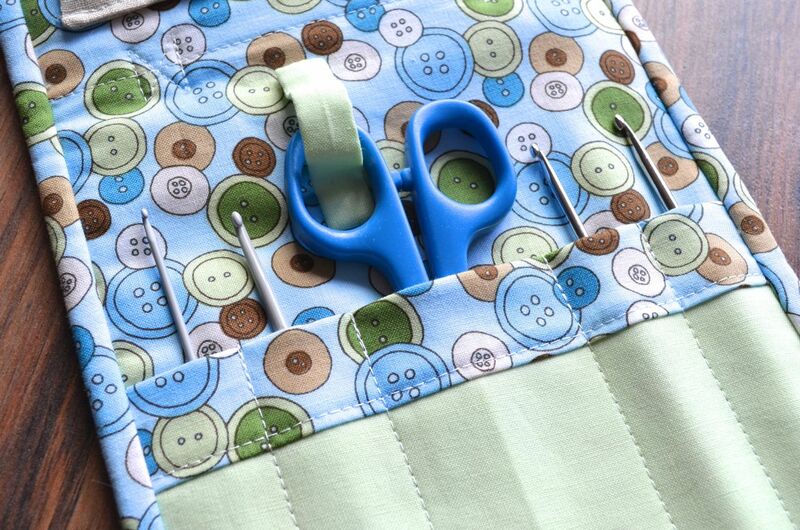 The sewing kit is on its way to Switzerland right now. I really hope my sister likes it and that it comes in handy whenever she’s working on a project. 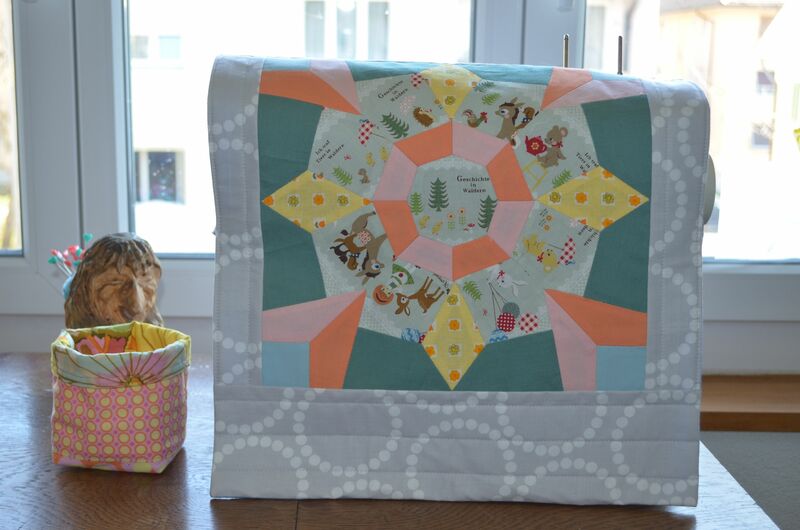 I’m linking up to Crazy Mom Quilts’ Finish it up Friday and ticking another item of my FAL list. “You spin me right round, baby, right round, like a record, baby, right round, round, round.” Do you remember that song? It’s one of my favourites. It inspired me to make this block. Which I then turned into this cushion. Which gives me another tick on my 2013 FAL list. Go Girl!